The MoProAuto Original! The Dodge Challenger is a modern day classic muscle car, and auto dealers across the nation will add these vehicle specific vinyl graphics for an easy upgrade. 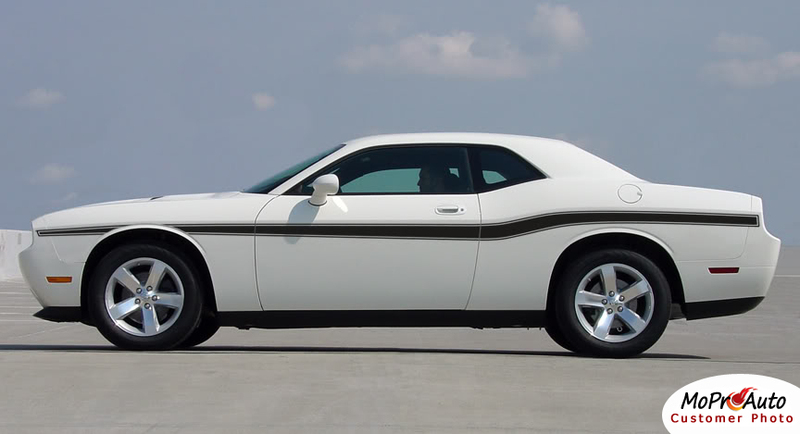 This vinyl stripe is an OEM style retro middle body line side door accent stripe package designed for the 2008 2009 2010 2011 2012 2013 2014 2015 2016 2017 2018 2019 Dodge Challenger. The vinyl graphic sections included with this vehicle specific kit are driver and passenger vinyl graphic decals. Choose the options needed from the menu, including the premium cast vinyl grade. Excellent Fit Every Time : Each vehicle specific MoProAuto Pro Design Series Vinyl Graphic Kit is pre-designed, test fitted, and sold to auto dealers before being made available to the general public, for a perfect fit with little to no trimming needed. 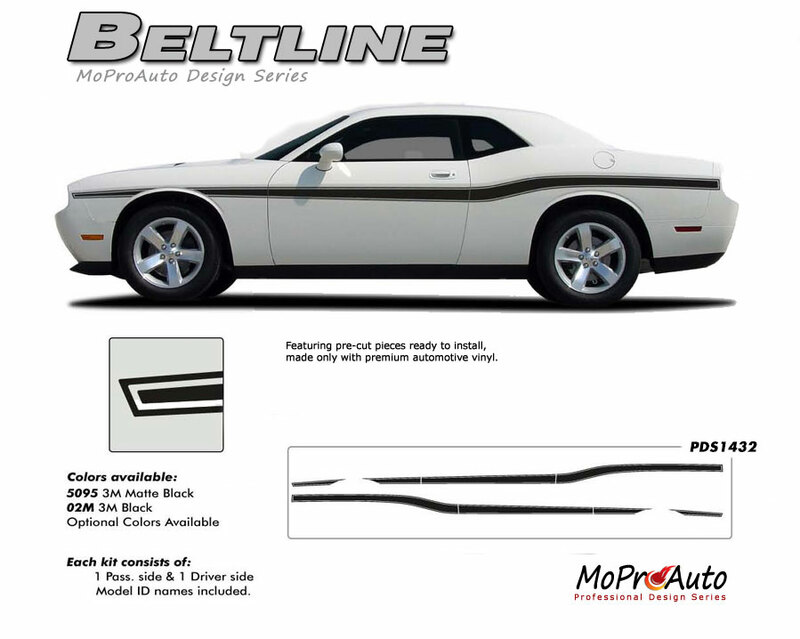 Application Fitment : These professional quality MoProAuto Pro Design Series Vinyl Stripe Kits fit Dodge Challenger from 2008 2009 2010 2011 2012 2013 2014 2015 2016 2017 2018 2019 model years. Examples showing post-installations for local automotive dealerships, local clients, and/or online submitted customer photos. Non-photoshopped pictures showing actual installations of this MoProAuto Pro Design Series vinyl graphic. See the true fitment of these carefully designed vinyl stripe kits for the most professional job possible! Use MoProAuto, because our fitment makes the difference! Do you want durability? At MoProAuto we only offer the Highest Quality Premium Cast Automotive Vinyl available today. Featuring vinyl by either 3M, Avery, or Ritrama, this vinyl graphic is designed to last five to 12 years in vertical positions depending on the vinyl series purchased and post installation care given. It's far more durable than our competitors' cheap, thick, indoor grade calendared vinyl film that can start to degrade in just 6 months to 1 year! Most of our vehicle specific vinyl graphic kits are expertly "cut to fit" by professionals for the make, model, and year indicated. The vinyl graphic film used from 3M and Avery Dennison offer manufacturer ratings of five to 12 years for life expectancy of the vinyl, when manufacturer care tips are followed carefully. See our installation and care links for more details on the cast vinyl series used and how to get the longest life from these OEM factory style auto stripes. Pro Styling and Perfect Fit! MoProAuto Pro Design Series vehicle specific vinyl graphic kits have been precisely designed, measured, and test fitted to replicate factory OEM styles for the most professional job possible. We provide these graphic kits to 3M Preferred Professional Installers, Professional Restyling Shops, Automotive Dealerships and Auto Body Shops across the country. Remember to use MoProAuto and choose a quality vinyl graphic design, because our fitment makes the difference! MoProAuto supplies automotive dealerships, auto body shops, professional installation shops or anyone looking to add an exterior automotive accessories including racing stripes, body stripes, hood stripes and more to add style to many makes, models, and years. We also ship our decals fast, so your car or truck can have a high quality vinyl graphic decal kit in just a few days. These MoProAuto Pro Design Series vehicle striping kits, vinyl decal packages and striping accent kits are easy to install, so please be sure to view our installation page and Youtube channel for installation help. You can also find a qualified 3M or Avery Installation Professional in your area. Many hours are spent in design and test fittings these vinyl graphic designs for the most best and most reliable vinyl graphic fitment available. Any installation professional you use will be glad you choose a vinyl graphic product that has been tested for proper fitment for easier and faster installations. Countless hours are spent in design and test fittings to make sure of the reliability of each vinyl graphic. Vinyl quality is constantly being tested to make sure the product you receive will adhere properly to your vehicle. And no old stock here! Our quality control department monitors stock levels to make sure you are receiving a brand new vinyl product, all stored in our climate controlled facility. You ordered the best, so expect the best! Each vinyl decal section is pre-cut from professional grade 3M, Avery, or Ritrama automotive grade high performance cast vinyl. Our team of professionals use modern manufacturing techniques allowing us to offer the highest quality vinyl graphic and decal striping kits available on the market today. Installing a MoProAuto Pro Design Series graphic will be easy when you take your time and read all available installation material. Each vinyl graphic decal is precision cut ensuring an exact fit for the make, model, and year of the vehicle with little to no trimming needed. MoProAuto Pro Design Series vinyl graphic striping decals are produced in thicknesses of 2-mil to 3.5-mil, offering a thin paint like surface in a "high performance" vinyl graphic film, made specifically for the automotive vinyl graphic industry. Vinyl graphic films from 3M, Avery Dennison, and Ritrama offer premium manufacturer ratings for years of life expectancy of the vinyl, when manufacturer care tips are followed carefully. Do you want the best quality for your vehicle? Yes! You purchased a $30k, $40k, or even $50,000 vehicle. Don't you want the best quality available? Vinyl graphic kits purchased from a dealer parts department or retail outlet will easily cost you $500 - $1000, and then some! We offer the same premium factory quality vinyl at the best prices possible! If you find a "better price" on what looks to be a "comparable" MoProAuto graphics kit, then what they say is true . . . you get what you pay for - a lower quality vinyl from an unproven source! Durability and classic styles are found in the MoProAuto Pro Design Series brand. It all comes down to fit and quality! These Pro Design Series vinyl stripes offers the highest quality professional cast vinyl films made for the automotive vinyl graphic industry. Only the best 3M, Avery, or Ritrama vinyl are featured, because of the durability and dependabilty of these brands. These vehicle specific vinyl graphic kits are made with installation in mind, because they are precisely designed, measured, and test fitted to replicate OE factory kits before being sent to the auto market. This is why 3M and Avery professional installers, automotive dealers, body shops, and everyday muscle car enthusiasts and truck owners choose these vinyl graphic kits! Fast Shipping! Most orders are produced and shipped within 24 hours of online ordering! No matter the age or cost of your vehicle you can choose one of MoProAuto's vehicle specific or "universal fit" graphic designs to add value and style to your ride! We have thousands of styles to choose from, so please add MoProAuto to your list of automotive restyling specialists! We realize if you are an auto dealer with a new car sold, and your customer is wanting a vinyl graphic installed now, we ship our decals fast so your car or truck can have a high quality vinyl graphic decal kit in just a few days. These vinyl racing stripes and rally graphic decal kits are the same high quality found at local automotive car dealerships and vinyl striping professionals. This is why auto dealers, auto body shops, car wrap professional shops, pro certified installers, or anyone looking for an exterior automotive accessory choose our MoProAuto Pro Design Series for their vinyl graphic kit needs. If you truly value your vehicle, then please accept quality that is unmatched, by choosing a MoProAuto premium Professional Design Series vinyl graphic! - 3M vinyl ships within 24 hours. - Avery and Ritrama ships within 48-72 hours. - Exceptions may apply. Contact us for exact shipping times. - Using only Premium Cast 3M, Avery, or Ritrama Professional Grade Vinyl Products! - Easy Installation! Ask for installation tips and do it yourself, or use a qualified professional in your area! - Offering Professional Vehicle Specific and "Universal Fit" automotive vinyl graphic kits! Since 2003, we have recieved thousands of positive reviews from satisfied customers who have purchased our professional products! Below is just a sample of the positive feedback coming from 1000's of happy customers who have purchased from our online sales venues. We pride ourselves with being the original provider of the MoProAuto Pro Design Series vinyl graphic line since 2003! You can buy with confidence knowing that other people like you have enjoyed the products we offer!